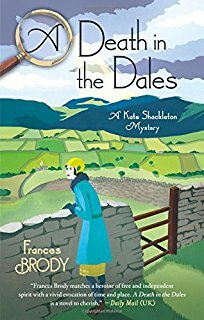 Frances Brody’s newest Kate Shackleton mystery is one of her finest, an intricately plotted tale of crimes old and new, in A Death in the Dales. Kate has taken her niece, Harriet, recovering from diphtheria, to stay for two weeks holiday at the Langcliffe home of Freda Simonson, now deceased, whose nephew, Dr. Lucien Simonsson has been courting Kate. It’s to be a time to build up Harriet’s health, but the shadow of an old crime hangs over the town. Freda Simonsson was the only witness to the murder of the landlord of the tavern across the road, and believed till her dying day that the wrong man had been convicted of that murder. Kate will soon find herself reading Freda’s notes on the crime, her voice reaching out to Kate from the grave, while Harriet befriends a young girl whose brother is missing. Her quiet vacation time suddenly seems very full indeed, with sleuthing around the various farms. For if Freda was correct and the wrong man has been put to death, that means a murderer is still on the loose in the Yorkshire town. This was one of Auntie M’s favorite Brody novels to date. The several plot lines come together in a way that’s extremely satisfying, as does the personal part of Kate’s life. Of course, her partner Jim Sykes and housekeeper Mrs. Sugden make an appearance, but it’s Kate who rules the day. A satisfying entry in the series; Highly Recommended. Redemption Road is John Hart’s thriller featuring cop Elizabeth Black, who rescued a young girl from a locked cellar and shot her kidnappers dead. But she’s also hiding a secret, and so are those around here. Filled with twists and turns. A Banquet of Consequences is Elizabeth George’s newest Lynley/Havers mystery, a mix of complex plotting and psychological suspense, when a troubled young man’s suicide sets off a string of events that culminate in another death. This one was Highly Recommended when it debuted and readers who missed it at first can find it now in paperback.